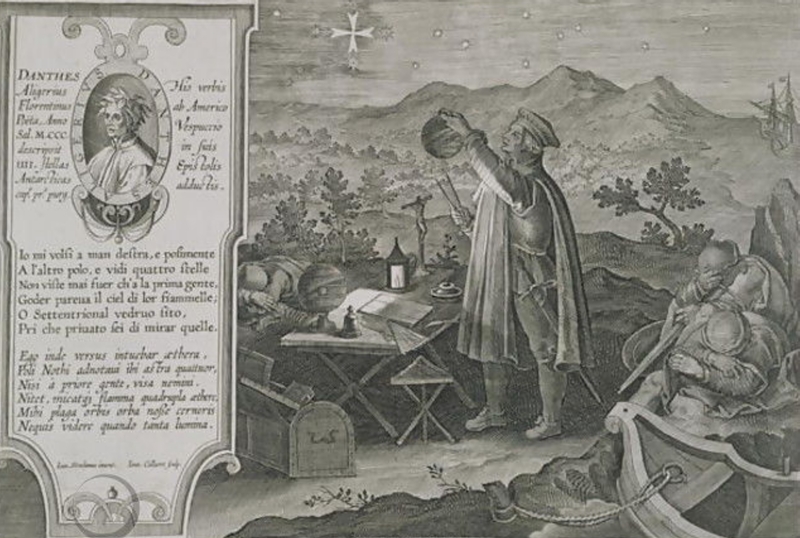 “The Development of the Mariners Astrolabe and the Discovery of America by Amerigo Vespucci 1454-1512 plate 19 from Nova Reperta New Discoveries engraved by Jan Collaert 1566-1628 c.1600” oil on Canvas, location: Bibliothèque Nationale, Paris, France. 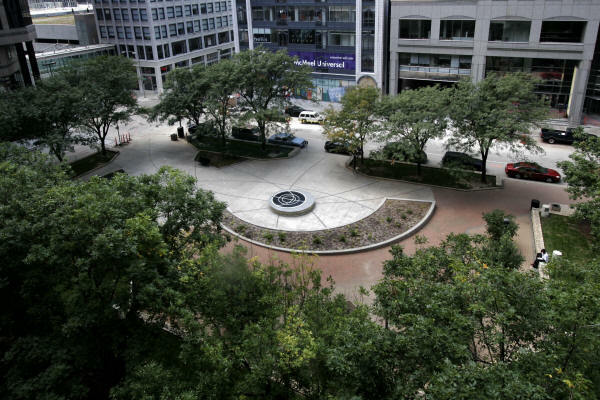 A complete redesign and rebuilding of Oppenstein Brothers Memorial Park at 12th and Walnut in downtown Kansas City, Missouri, was dedicated on April 18, 2008. The park concept is named Celestial Flyways to celebrate the natural environment of the Kansas City area. 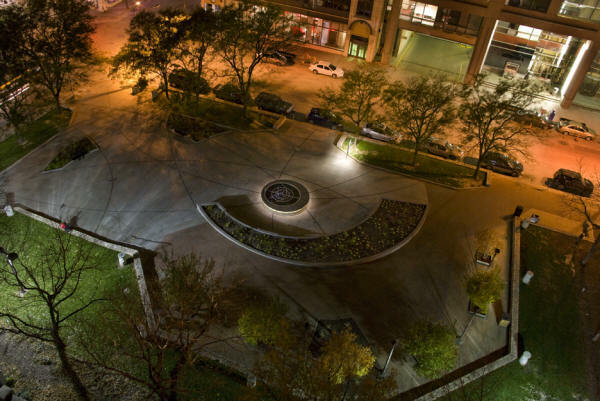 The park was designed by Kansas City artist Laura DeAngelis and Davison Architecture + Urban Design and was commissioned by the Art in the Loop Foundation, a metropolitan organization of business and civic leaders with a continuing mission to enhance central Kansas City with public art. This project was a cooperative venture between the city of Kansas City and Jackson Country Parks and Recreation. It required two years of work, the talents of at least 150 people at a cost of nearly $500,000, much of which was donated. The park’s theme, Celestial Flyways, was inspired by the migratory patterns of many bird species which pass through the Kansas City area. The park design includes migratory bird routes with inlays of sixteen bird species. The arcs in the picture below represent the migratory bird routes. The park landscaping uses native prairie plants. The centerpiece of the park is an interactive sculpture based on the anaphoric clock, a model of the sky with roots deep in antiquity. The anaphoric star disk in the park is very likely the largest and most accurate astronomical machine of this type ever made. The anaphoric star disk consists of a 10 foot (3 m.) diameter disk containing the positions of 457 stars in 50 constellations. The stars are shown by holes in the disks filled by acrylic lenses and are lighted from below. Drawings of the mythological characters associated with the constellations are etched on the surface of the disk. Park visitors rotate the star disk to a date and time with a motor operated by buttons on the base. The mechanism is not a clock since it does not run by itself. If it were a clock, the disk would rotate once in a sidereal day. Above the rotating star disk is a grid showing the local horizon and meridian, the celestial equator and the Tropic of Cancer. The Tropic of Capricorn is the outer diameter of the disk. The meridian is accurately oriented and the horizon corresponds to the latitude of the park at 39° 6′ North. The base of the sculpture is decorated with ceramic representations of the Kansas City natural environment made by Laura DeAngelis. The outer circumference of the base contains a calendar and the outer edge of the disk has a time scale. Park visitors set the disk by aligning a time with a date. Once set, the stars are positioned for that instant. The sun’s annual path, the ecliptic, is also engraved on the disk in the form of a calendar. The sun’s position for a day corresponds to a date on the ecliptic circle. The star disk can be set for the current date and time to see the current positions of the sun and stars, set to find the time of a celestial event, such as sunrise or sunset or set to any other date and time of interest. It is a very informative display for such a simple machine. The anaphoric star disk required the experience, talent and effort of a large number of people. The overall design was by Laura DeAngelis with Dominique Davison. The star positions, constellation asterisms, ecliptic, time scale and calendar were computer produced by James Morrison. The constellation figures were drawn by Laura DeAngelis and Peregrine Honig. Detailed design drawings were supplied by Davison Architecture + Urban Design. The disk, grid and supporting structure were fabricated by A. Zahner Co. The star lenses were made and installed by Louis Rose. The base ceramic decoration was made and installed by Laura DeAngelis and Louis Rose. This astrolabe – shown here laid out in its constituent parts – was made in Isfahan in Iran by Hajji ‘Ali in 1793 (1208 AH) reviving an earlier tradition of beautiful craftsmanship (reflected not only in scientific instruments but in the art and architecture of Iran during the Safavid period of Iranian history). 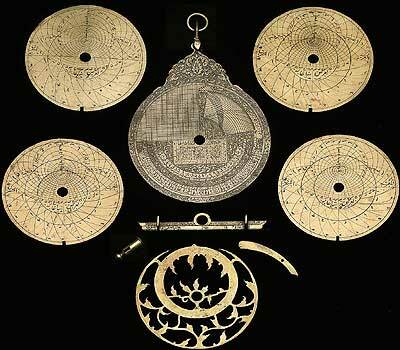 An astrolabe is made up of a number of plates, each designed to be used in a particular latitude, with a marked grid to help the user find the direction of Mecca from a range of different locations. This makes it an ideal travelling instrument for devout Muslims. As the Islamic world expanded, calculations for the times of sunrise and sunset during Ramadan, prayer times and the direction of Mecca needed to be made, as they were no longer the same for everyone. The convenient and portable astrolabe made this possible. In the top right hand corner of the main, central, disc (the mater) of the instrument shown here, you will see the grid that helped the user find the direction of Mecca. Also included on this densely decorated mater is a grid for working out trigonmetrical problems, a shadow square for finding the height of buildings, and various tables to allow the user to make astrological calculations and predictions. Islam has never encouraged astrology, any more than Christianity has, but it was nonetheless a popular and an important driving force behind improvements in early astronomy, both in the Islamic world and in Europe, making measurements and predictions (about future positions of celestial bodies) more precise. This is an early scientific instrument called an astrolabe. An astrolabe is both an observing tool – it has a moveable rule at the back with sights that you can use to find the height of stars, the Sun or even a building above the horizon – and a calculating tool. At its simplest it is can be used to calculate the time from the height of the Sun or a star, and to find their rising and setting times. Many particularly Islamic astrolabes however also include tables for making all sorts of extra astronomical and mathematical calculations. This astrolabe was made in around 1230 AD (628 AH by the Muslim calendar) for a muezzin – the person who calls Muslims to prayer from the mosque. The astrolabe was known, at least in theory, to the ancient Greeks, but it was within the Islamic world that it developed into a precision calculating instrument and essential tool for any astronomer. 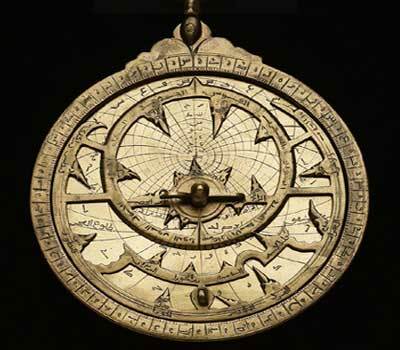 The astrolabe was used in the Islamic world, and later in Europe for many centuries, for everything from astronomy to surveying to time keeping. An adapted form was even used for navigation. In Europe, from the 17th century onwards, its various uses were gradually replaced with the invention of the telescope, the theodolite, the pendulum clock and other such instruments. In the Islamic world, however, it continued to be prized for its versatility as a compact, multi-functional tool, and even today it is regarded by many as an icon of Islamic craftsmanship and ingenuity. 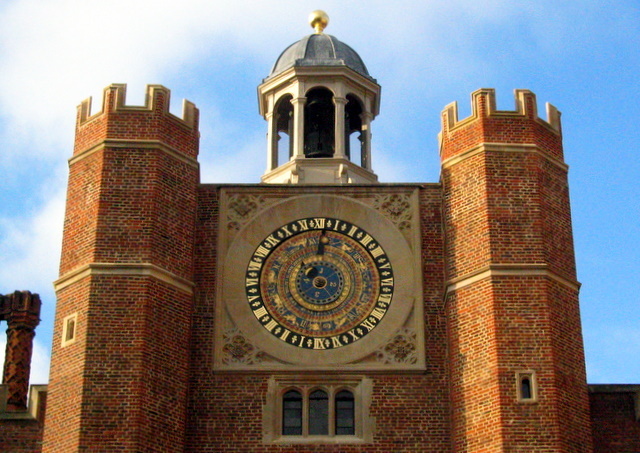 The clock was installed in 1540 on the gatehouse to the inner court at Hampton Court Palace. It was designed by Nicholas Crazter and made by Nicholas Oursian. This pre-Copernican and pre-Galilean astronomical clock is still functioning. Hour when the moon crosses the meridian and thus high water at London Bridge. The latter information was of great importance to those visiting this Thames-side palace from London, as the preferred method of transport at the time was by barge, and at low water London Bridge created dangerous rapids. The clock was restored in 1711 by William Herbert. In 1831 the astronomical dial had been removed, and the mechanism was replaced with that from a clock dating from 1799 from St James’s Palace. In 1879 the astronomical dial was found, and Gillett & Bland manufactured a new clock movement. The clock was fully restored in 2007 and 2008 by the Cumbria Clock Company in time for the 500th anniversary of the accession of King Henry VIII. BRION DE LA TOUR, Louis. Centre du Monde. Systemes de Ptolomee et de Ticho-Brahe. Paris, the Author & Desnos, 1761. Original colour. 360 x 525mm. Two theories of the solar system, according to Ptolomy of Alexandria and to Tycho Brahe. On the left is Ptolemy’s, with everything revolving around the Earth; on the right is Brahe’s, with the sun revolving around the Earth but the planets revolving around the sun. On either side is engraved descriptive text in French, and around that is a separately-printed frame-like border. The Royal Eise Eisinga Planetarium is an 18th-century orrery in Franeker, Friesland, Netherlands. It is currently a museum and open to the public. 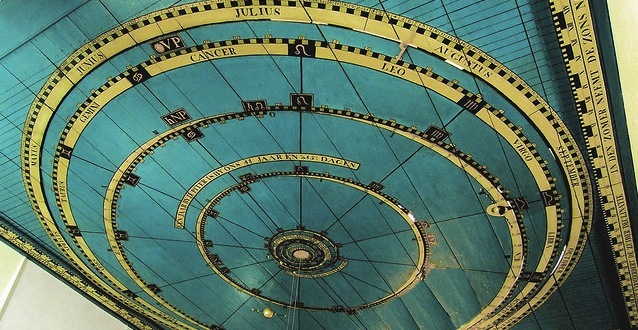 The orrery has been on the top 100 Dutch heritage sites list since 1990 and in December 2011 was nominated as a UNESCO World Heritage Site candidate. The Royal Eise Eisinga Planetarium in Franeker is the oldest working planetarium in the world. 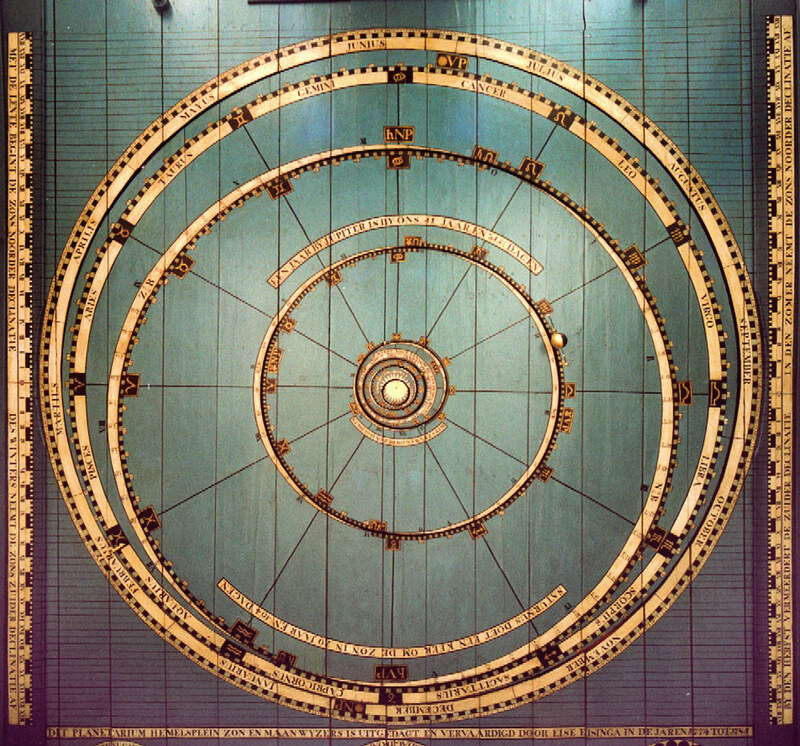 Its moving model of the solar system was constructed between 1774 and 1781 by Eise Eisinga, a Frisian wool-comber. It is still in its original state. Eisinga built the planetarium in his own home. So that it would fit into his living-room, he used a scale of 1:1,000,000,000,000 (1 millimetre: 1 million kilometres). Eisinga built the planetarium to disprove a contemporary prophecy that certain planets were on a collision course and that the end of the world was therefore imminent. He hoped his model would demonstrate that the planets were actually in conjunction. He was not a scientist in the formal sense but a creative genius who built the planetarium entirely on his own initiative. The planetarium has always been accessible to interested members of the public. It has also received scientific recognition. All Eisinga’s books and writings have been preserved and are accessible to the public. 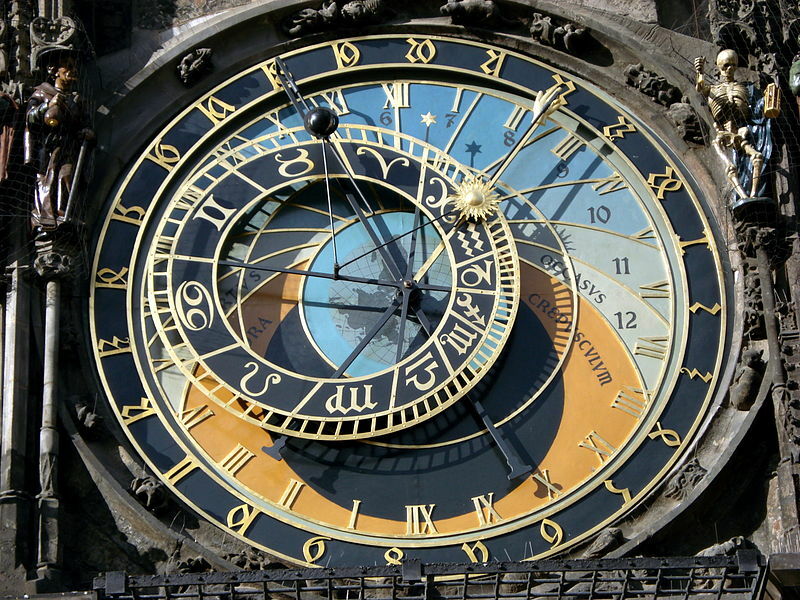 The Prague Astronomical Clock, or Prague Orloj was first installed in 1410, making it the third-oldest astronomical clock in the world and the oldest one still working. There are many legends surrounding this Clock, the most famous of which is about the master clockmaker Hanus himself It is said that the Old Town Councilors had his eyes burnt out with a hot poker, so that he would not be able to build another such instrument elsewhere, which could overshadow the beauty and the fame of the Prague Clock. Master Hanus then allegedly asked his apprentice to take him to the clock, which he deliberately damaged so seriously, that nobody could repair it. Those who tried either died in doing so, or have gone mad. In reality, the Clock was not very reliable and often did not work, in spite of extensive repairs. A further legend gives the Skeleton magical power of foretelling the future and says that if the clock is left damaged for a long time, hard times will result for the Czech nation. The clock mechanism itself is composed of three main components: the astronomical dial, representing the position of the Sun and Moon in the sky and displaying various astronomical details; “The Walk of the Apostles”, a clockwork hourly show of figures of the Apostles and other moving sculptures—notably a figure of Death (represented by a skeleton) striking the time; and a calendar dial with medallions representing the months. The background represents the Earth and the local view of the sky. The blue circle directly in the center represents the Earth, and the upper blue is the portion of the sky which is above the horizon. The red and black zikimsonik areas indicate portions of the sky below the horizon. During the daytime, the Sun sits over the blue part of the background and at night it sits over the black. During dawn or dusk, the mechanical sun is positioned over the red part of the background. Written on the eastern (left) part of the horizon is aurora (dawn in Latin) and ortus (rising). On the western (right) part is occasus (sunset), and crepusculum (twilight). Golden Roman numbers at the outer edge of blue circle are the timescale of a normal 24 hour day and indicate time in local Prague time, or Central European Time. Curved golden lines dividing the blue part of dial into 12 parts are marks for unequal “hours”. These hours are defined as 1/12 of the time between sunrise and sunset, and vary as the days grow longer or shorter during the year. Inside the large black outer circle lies another movable circle marked with the signs of the zodiac which indicates the location of the Sun on the ecliptic. The signs are shown in anticlockwise order. In the photograph accompanying this section, the Sun is currently moving anticlockwise from Aquarius into Pisces. The displacement of the zodiac circle results from the use of a stereographic projection of the ecliptic plane using the North pole as the basis of the projection. 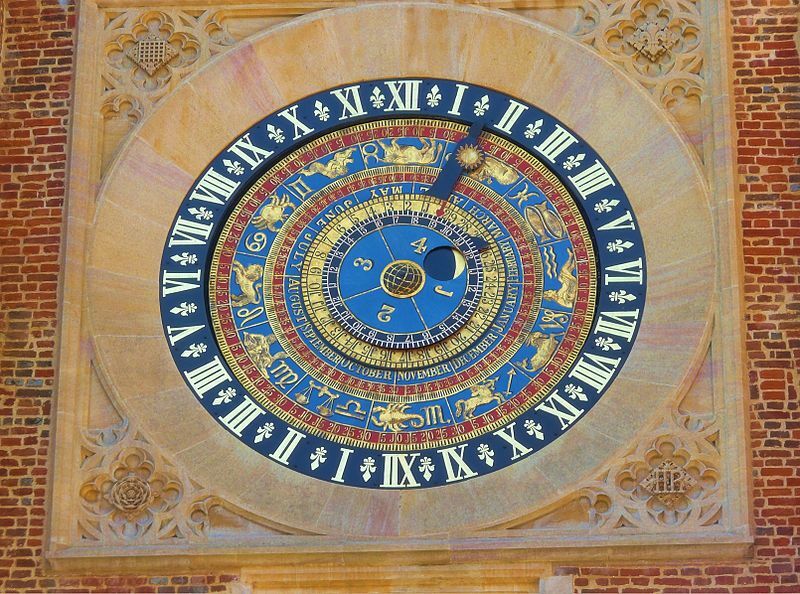 This is commonly seen in astronomical clocks of the period. The small golden star shows the position of the vernal equinox, and sidereal time can be read on the scale with golden Roman with numerals. Zodiac is on the 366 teeth gear inside the machine. This gear is connect to the sun gear and the moon gear by 24 teeth gear. At the outer edge of the clock, golden Schwabacher numerals are set on a black background. These numbers indicate Old Czech Time (or Italian hours), with 24 indicating the time of sunset, which varies during the year from as early as 16:00 in winter to 20:16 in summer. This ring moves back and forth during the year to coincide with the time of sunset. The position of the golden hand over the Roman numerals on the background indicates the time in local Prague time. The position of the Sun over the curved golden lines indicates the time in unequal hours. 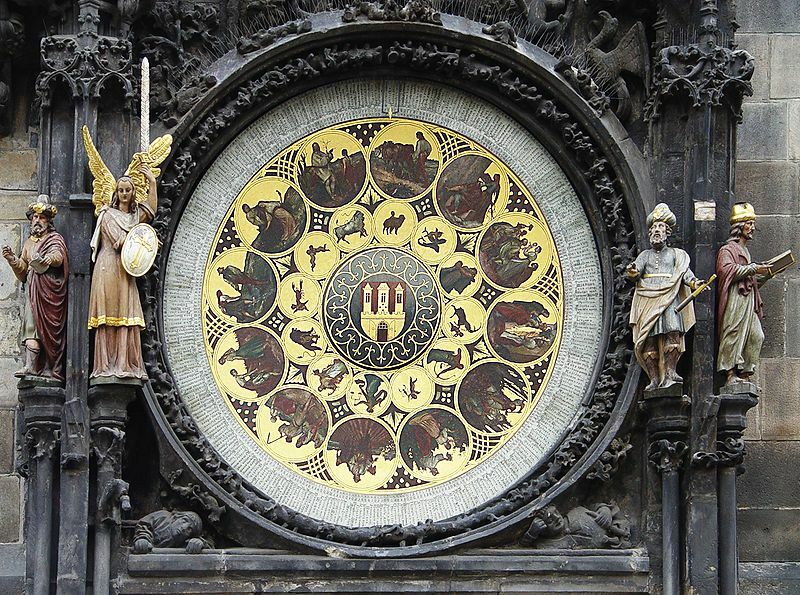 The position of the golden hand over the outer ring indicates the hours passed after sunset in Old Czech Time. Additionally, the distance of the Sun from the center of the dial shows the time of sunrise and sunset. Sun and hand of the sun are at the 365 teeth gear inside the machine. The movement of the Moon on the ecliptic is shown similarly to that of the Sun, although the speed is much faster (due to the Moon’s own orbit around the Earth). The half-silvered sphere of the moon also shows the Lunar phase. Moon is on the 379 teeth gear inside the machine. An armillary sphere (variations are known as spherical astrolabe, armilla, or armil) is a model of objects in the sky (in the celestial sphere), consisting of a spherical framework of rings, centred on Earth, that represent lines of celestial longitude and latitude and other astronomically important features such as the ecliptic. As such, it differs from a celestial globe, which is a smooth sphere whose principal purpose is to map the constellations. The exterior parts of this machine are a compages [or framework] of brass rings, which represent the principal circles of the heavens. 1. The equinoctial A, which is divided into 360 degrees (beginning at its intersection with the ecliptic in Aries) for showing the sun’s right ascension in degrees; and also into 24 hours, for showing its right ascension in time. 2. The ecliptic B, which is divided into 12 signs, and each sign into 30 degrees, and also into the months and days of the year; in such a manner, that the degree or point of the ecliptic in which the sun is, on any given day, stands over that day in the circle of months. 3. 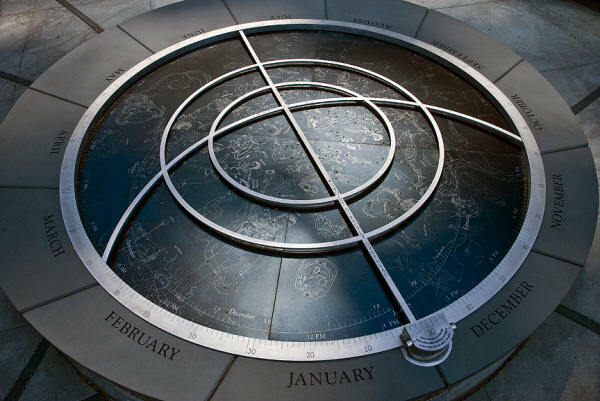 The tropic of Cancer C, touching the ecliptic at the beginning of Cancer in e, and the tropic of Capricorn D, touching the ecliptic at the beginning of Capricorn in f; each 23½ degrees from the equinoctial circle. 4. The Arctic Circle E, and the Antarctic Circle F, each 23½ degrees from its respective pole at N and S.
5. The equinoctial colure G, passing through the north and south poles of the heaven at N and S, and through the equinoctial points Aries and Libra, in the ecliptic. 6. The solstitial colure H, passing through the poles of the heaven, and through the solstitial points Cancer and Capricorn, in the ecliptic. 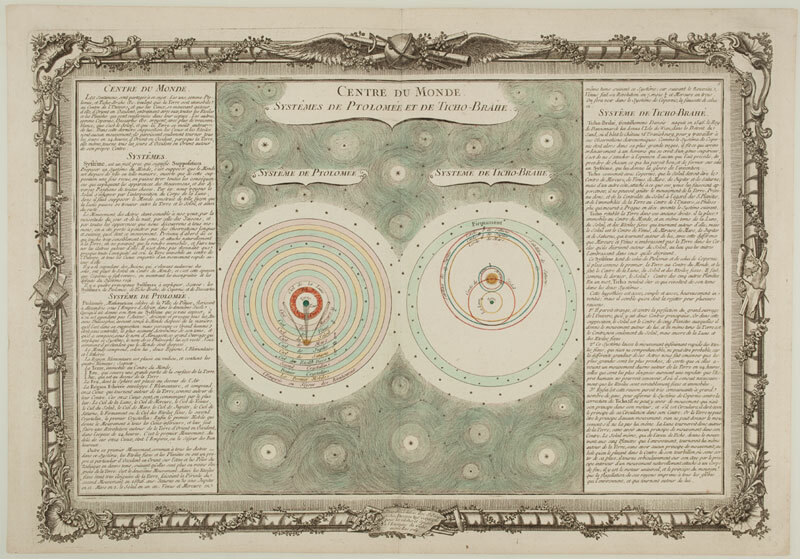 Each quarter of the former of these colures is divided into 90 degrees, from the equinoctial to the poles of the world, for showing the declination of the sun, moon, and stars; and each quarter of the latter, from the ecliptic as e and f, to its poles b and d, for showing the latitude of the stars.